Have you launched your first website and are now waiting for your site to rank in the search results? Maybe you’ve heard that you have to do “SEO“ in order rank but you’re not quite sure where to begin. This article will help you get started with SEO by showing you how to optimize for the most important SEO basics with Ryte. The concept of “search engine optimization” is often difficult for beginners to grasp, as there are plenty of myths, lies, and half-truths floating around about achieving top rankings on Google. First, the good news: SEO is not magic, but a skill. Second: SEO is something you can learn and everyone started at some point. Third, SEO is constantly evolving, so it’s important to have your finger on the pulse of the latest industry trends and search engine updates. While the term “search engine optimization” is still used today, it does not really go far enough. Websites are certainly optimized in such a way that search engines can index their content better (include it in the index of a search engine). Ultimately, however, you always have to ask yourself: Who is using my website? Obviously, people. You should optimize your website primarily to meet their needs. The following applies to search engine optimization: If it’s good for your users, it’s usually good for search engines. While the abbreviation SEO currently stands for search engine optimization, today it would be more appropriate to call it “search experience optimization” as SEO aspires to optimize a user’s search experience. The purpose of search engine optimization is to optimize your website so that search engines can easily index your content, all the while providing your visitors a technically flawless, user-friendly site that can be accessed at any time. In doing so, you try to offer the best site on your topic, both technically and in terms of content. Search engine optimization is often difficult to grasp, especially for beginners. Alongside the countless areas, there are also a number of terms that make even simple measures appear very complex. That’s why we’ve selected the 5 basics of technical search engine optimization for you so that you can get started with SEO. Let’s get started. 1. You have to make sure that your pages can be indexed by Google. Before search engines, like Google, can display links to your page in the search results, your page must first be indexed. You can think of the Google Index as an enormous library. The most important elements and contents of billions of websites are stored there. Every time a user performs a Google search, Google refers to this “library.” Google uses an automatic program called Googlebot to obtain information about a website. This Googlebot constantly follows links on the internet and searches websites for content. This is called “crawling.” It stores the content it finds in the Google index. You can check if this is the case by visiting your website. After that, click on the right mouse button and then on “Show page source text.” Now click CTRL+F (Apple: cmd+F) and search the source code for “index,follow.” If this line is in the source code, you can be certain that the Googlebot is allowed to index the page and follow the links on it. Figure 1:Inspect Robots instructions using Ryte. When people search for something on Google, the snippet is the first thing they see from your site in the search results. The snippet consists of a blue title, the URL of your page in green, and a description. Figure 2: Snippet in the Google search. Google creates the snippet using “meta tags” found in the source code of your website. Meta tags are information in an HTML document that can be read by machines. The page title must be defined for each HTML document. It briefly describes the content on that HTML page. What is special about the page title is that it can influence the placement of a website in the Google search results. It is therefore important that the page title contains the main keyword of the target page. Where can I find the page title? The page title is usually at the top of the source code of a website. You can usually change the page title very easily via your website editor or content management system. The page title should not exceed 70 characters or the title in the snippet will be cut off by Google. It is important that the page title is always unique. In other words, you create a separate title for each web page on your site. Here you can find a summary of what characterizes a good page title. With Ryte, you can easily manage your page titles. In the Website Success module, click on “Content,” then on “Title,” and finally on “Title Length.” Subsequently, you will be shown all page titles that are acceptable, too long, too short, or not set. Figure 3: Analyzing page titles with Ryte. The list of URLs shows the respective page title saved within Ryte. You can also use this list to check whether the main keyword is included. The meta description is another meta tag of an HTML page. It consists of text and describes the content of the target page for search engines. If a meta description exists, it is generally used by search engines for the snippet on the search engine result pages (SERPs). The meta description has no direct influence on the placement of your site in the search results. You can use the text for the description to influence how frequently people click on your search result, therefore the meta description is important in terms of CTR. Where can I find my meta descriptions? Like the page title, you can also find the meta description in the source code of your website. In your content management system, there is usually a simple input field where you can enter a separate meta description for each URL. How long can the meta description be and what should it include? The meta description should be at least 170 characters long. Depending on the search result, Google may display longer description texts. The description should contain the main keyword. It’s also important that it contains a call-to-action or CTA to encourage users to click on your result. Figure 4: Review meta descriptions with Ryte. 3. Make sure your website is well-structured to help search engines understand and rank your content. Search engines require clarity so they know what topic your site is addressing. This is important because as soon as a user formulates a search query, the search engines use the index to check whether your site can provide an answer to that query. The H1 tags play a very important role in the structure of your website. H tags are markers in the HTML code that are intended for headings. The h tags are usually set from H1 to H4 in descending order of importance. The H1 tag is used to “tag” the main heading. That is why it is also called the ”H1 heading.” Typically, this is also the headline with the largest font size. Therefore, it not only orients search engines, it also helps your visitors navigate your content. So, what do I have to keep in mind about the h1 tag? The H1 header should only be used once per URL. Additionally, it should include the most important keyword of the URL. Figure 5:Check H1 tags with Ryte. 4. Update your content and create new content for real users. The material on your website is called content. Most of the time this means text, but content can also consist of pictures or videos. The first important rule for beginners is: Create content primarily for your users and not for search engines. Therefore: Everything that is useful for your users is generally also useful for Google. Make sure that your texts offer real added value and do not consist of an accumulation of keywords aka keyword stuffing. For example, try to imagine what questions users might have when they search for your content and answer these user questions using your content. Structure your content into meaningful and short paragraphs. Internet users usually have little time to read. The faster they can understand the content, the better. Use subheadings that provide a preview of the content of the following paragraph. Try to answer the questions asked by users in each of the paragraphs. Use bullet points in your content. That makes it easier for both search engines and users to quickly understand the content. As part of content maintenance, the content must also provide a suitable answer to the search queries of your users. To find out which terms your content should contain in order to best meet user needs, you can use Ryte’s Content Success report. 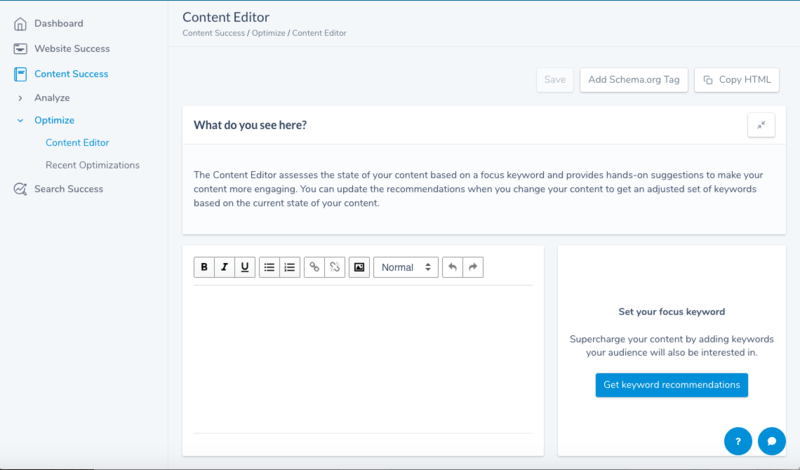 In the “Optimize” section, you will find the Content Editor. It helps you to create texts suitable for both users and search engines. Figure 6: The Content Editor from Ryte. 5. Optimize your pictures, because they can also be used to achieve good rankings. Images improve the quality of your content and can help also generate additional traffic to your website. The reason is that search engines like Google do not just allow users to search the web, they also make it possible to search for images. Google’s image search, for example, is the second most frequently used search engine in the world. If your images rank highly in the Google Search, this can drive more traffic to your website. When images are embedded into a web page, you have an important element that needs to be optimized. It is called an ”ALT tag” or ”ALT text.” This is a small piece of text that is displayed as an alternative when a browser cannot display an image. Reading aids for blind people can also use these ALT tags. ALT tags are also an important method for search engines to assign content to images. Therefore, ALT tags are important for image searches. You can create the ALT tags for your website by yourself. In your content management system, there is an editor that you can use to customize and optimize ALT tags. What do I need to keep in mind when optimizing ALT tags? An ALT tag should briefly describe the image. Ideally, the tag will also contain the main keyword of the page upon which the image is embedded. Figure 7: Check ALT texts with Ryte. We did it. What’s the next step? As you’ve seen, with these 5 SEO basics there is already a lot of optimization potential that you can exploit even as a newbie. At the same time, this article demonstrates that sustainable search engine optimization starts with these basics. Those who’ve mastered these basics can, of course, delve deeper into technical optimization. There are many other aspects that you can gradually improve over time. The good thing is that Ryte can assist you in analyzing your website regardless of the size of your web project or level of knowledge. Interested in learning more? If you’re confused by SEO and marketing terms as a beginner, you’ll find simple explanations in our Wiki. If you’d like to learn more about SEO, you will find well-founded articles in Ryte Magazine. Here you will find a detailed explanation of the question “What is SEO?” Here, you can get your free SEO starter kit, which we created in cooperation with Hubspot. With this in mind: Let’s do SEO the RYTE way! Published on 04/01/2019 by Philipp Roos.